1. 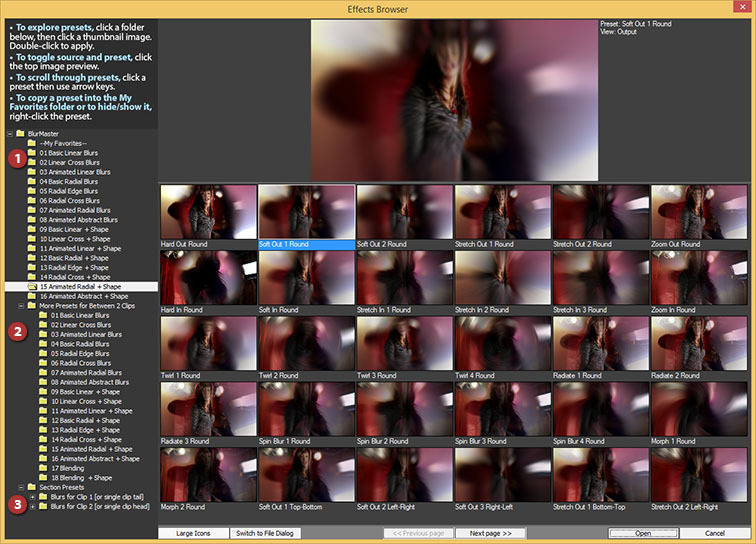 In the Transitions Room tab of PowerDirector (version 12 or later), drag-and-drop BlurMaster from the Pixelan section onto the transition overlap between two video clips in a track of the timeline. 2. Click the Modify button above the timeline (or right-click the transition and choose Modify), then click the Stand-alone Effect button to open the BlurMaster main window. (1) To make initial changes towards a desired look, use the Blur Clip 1/2 sections of the plugin to adjust main blur settings. To quickly try pre-made settings, click the section’s blue FX folder Section Presets button -- a Pixelan exclusive! (2) If needed, untwirl other sections of the BlurMaster plugin to fine-tune further. Add blends, mix in a subtle iris or linear shape to influence the transition’s progression. For detailed help per control, see below on this web page. (3) Set the transitions’s ease-in/ease-out, holds, or other timing as desired. You’re done! 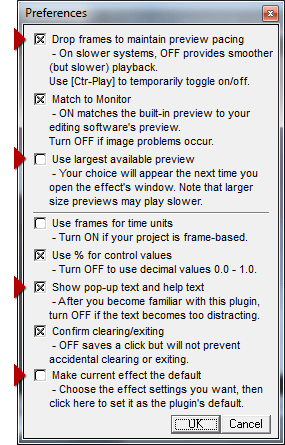 To save your new/modified look in our large visual Effects Browser for easy future re-use, click the Save button. (A) Load a Recent Effect. Click “Recent” to instantly access a submenu of your recently applied effects, saving time. (B) Undo/Redo. Click the green arrows to undo or redo your prior steps – great for experimenting with new looks/variations. (C) Serial/Version Info. Click the Pixelan logo to access this info. (D) Help. Click the blue ? button to access BlurMaster help. (E) Preferences. Click the asterik to adjust preferences for preview playback size and speed, time units, help text visibility, setting the default BlurMaster effect, etc. (F) Save an Effect. Click the disk to save a favorite effect as a preset you can re-load instantly. (G) Clear Settings. Click the minus sign to clear current settings. (H) Apply. Click the green check mark to apply the effect & close the window. To exit without changes, click the X in the top right corner. (I) Section Presets. Click an FX folder icon to instantly change only the controls in that section via handy presets we have developed. (J) Expand/Collapse Sections. To expand or collapse a section, use the “twirly” at the left of a control section. (K) Keyframing. Click the stopwatch icon to vary the control over time. A separate Keyframes window will open (see additional Keyframing help below.) Right-click a stopwatch to clear keyframing. (L) Context-Sensitive Help/Tips. Hover your cursor over any control or area to see extensive context-sensitive help and tips. (M) Keyframes Window. Click to open/ close the Keyframes window. See below on this page for tutorial help about the Keyframes window. (N) Preview Controls. Use these standard playback buttons to preview your effect. BlurMaster has two types of presets -- Effects Browser presets and Section presets. Unlike the most Effect Browser presets, these change ONLY some or all controls in ONE section of BlurMaster. Mixing presets from several sections is a quick and easy way to try hundreds of fresh transition variations. Click a blue FX folder icon at the right side of a BlurMaster control section ("I" in the above illustration) to instantly change ONLY the controls in that section via handy presets we have developed. Use this to quickly and easily make hundreds of new effect variations. For example, try different Blur presets for Clip 1 and Clip 2 without affecting what you have set up in the other controls of BlurMaster. NOTE: In Blur sections you can make even a two-step adjusments. Select the "main" Blur settings from some submenu with a prefix "Step 1" and then try the offset presets in "Step 2 - Add Offset" submenu. In the Preferences settings, you can customize BlurMaster significantly to your video editing system's power and your working style. At right are the default Preferences Settings. Four Preferences options in particular may be handy for you to change (all shown with an adjacent red triangle). If you have very fast video editing hardware, consider turning off "Drop frames to maintain preview pacing." If you also have a high-resolution monitor and are editing with HD or larger footage, consider turning ON "Use largest available preview" which will use the largest preview size in BlurMaster that can fit in your monitor while still leaving sufficient room for BlurMaster's controls. Note that your choice for this setting will appear the next time you open BlurMaster's window. After you become more familiar with BlurMaster, consider turning off "Show pop-up text and help text." That will leave more vertical space for the section controls and also reduce any distraction from the ever-changing help text. Last but not least, you can easily set a new default transition anytime within BlurMaster. Set up the transition control's as desired, then go into the Preferences dialog and choose "Make current effect the default." To VARY a control over time, use BlurMaster's powerful but easy-to-use keyframing. First make sure the transition's duration is set to what you want in Premiere's timeline. Then follow the simple process below. Letters shown in quotes refer to the illustration in the Basics Within BlurMaster section above. 1. Go to the frame where you want a control's value to BEGIN to vary over time during the transition. There are several ways to do this: use BlurMaster's built-in Preview Controls ("N"), or enter a frame time in the Current Time/Frame box ("P"). Or click the stopwatch icon ("K") next to the control to open the Keyframes Window, then drag the blue vertical frame marker left or right. 2. Adjust the control's value in the main BlurMaster window. In the graph, if a keyframe already exists at the current frame, the adjustment will raise or lower that keyframe. If a keyframe doesn't exist, the adjustment will insert a new keyframe in the graph, as shown at right. Changing the control's value adds a new keyframe, if not already present. TIPS: To hold/freeze the transition's progress, horizontally flatten all or part of the line. To experiment and revert if needed to earlier keyframing, use the Undo/Redo buttons ("B") in the main BlurMaster window. Note you can adjust keyframing while previewing plays. Progress Control the transition's progress over time, typically changing in value from 0 to 100. To ease-in/out the transition, adjust its start/end keyframes or add additional keyframes. To hold a transition, set two adjacent keyframes to equal value.